Each upcoming holiday I now find myself eagerly awaiting the extra special Little Lazies that will accompany its arrival. Is it just me, or do they keep getting better and better with each of these limited edition releases? 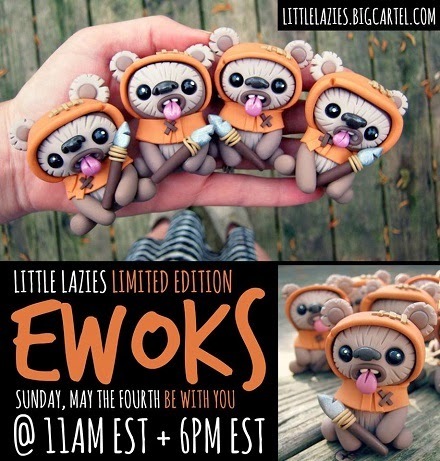 This "May The Fourth" you may not be able to build an entire furry little Endorian tribe (these are limited to one per customer), but you can recruit at least one Little Lazies "Ewok" figurine for your toy army. You'll have two chances to be quick with your mouse, with separate batches going up in the Little Lazies Big Cartel store at 11 am and 6 pm EST. The sole larger figurine, Mr. Wicket, will also be up for bidding on eBay (check the Little Lazies Facebook page for the link). Best of luck with procuring one, "May the force be with you!"